As a new parent you want your baby to be always in front of your eyes, don't you? You want to pay as much attention as you can to even their most mundane activities. But, sooner or later you realize that you have other things to do as well! There are chores to be done, food to be cooked, you name it. And the worst part is, you can't get everything done when your little bundle of joy is taking a nap. So, there will be times, as I am sure you already have experienced when you will need things to be done and your baby is in a mood of some play time! Leaving your baby unattended, playing by himself or herself is not a great idea at all. Fortunately, you have activity centers to make your life a tad easy. Activity centers (or 'ExerSaucers') are a modern take on a walker or a baby carrier. These nifty things keep your baby in place, safe and secured and keep them entertained as well. They are not meant to be mobile; rather they are designed to hold your baby securely and comfortably in one place. 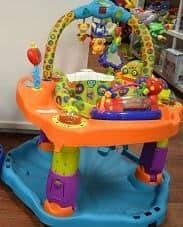 The activity centers also have a lot of toys, lights, and music to keep your baby entertained while you get some things around the house done in peace. Like most of the other baby products, there is no shortage of options when it comes to baby activity centers either. There are hundreds of models out there. So, the question is: Which baby activity center should you buy? Well, the answer to this question depends on several factors ranging from what you are looking for to what is your budget. However, there are certain things you want from an activity center that is not negotiable. You must keep some important factors in mind before you pick a baby activity center. Now, the obvious question is, what are these factors and what are some of the best activity centers on the market? That's precisely what we are going to find out in this article. We will be talking in detail about the activity centers themselves, how to pick them and of course some of the best ones you can buy. The most important and obvious difference between the two is the fact that activity centers and not mobile. They are not meant to help your baby get mobile and move around. Rather, they are designed to be stationary at one place. Activity centers have a comfortable swivel seat for your baby so that they can be supported in the upright position. Most of them also have a mechanism for the baby to bounce around securely for an added stimulation. The activity centers are designed so that they can support the weight of your baby and won't budge even if they bounce around to their heart's will. Most activity centers also have a lot more activities for the baby to do compared to a walker. There are many toys, lights, and music that will keep your baby entertained for a while so that you get some work done. So, in short, baby walkers and activity centers are two entirely different things. It is important to discuss this topic before we get into the discussion of which baby activity center to buy. You must remember that the activity centers are not babysitters. Sure, your baby will have a lot of fun while he/she is playing in it, but they are meant to be used for only short periods of time. Many parents make the mistake of using the activity centers as almost their go-to place when the baby becomes cranky and upset. It is not the right thing to do. Your baby needs to spend sufficient time in other positions such as on his/her belly, crawling and scooting. If you overuse the activity center, you are taking away the time he/she needs to spend in other positions. Make sure that you are letting your baby use the activity center for short periods of time when you need to get some work done. But most importantly, make sure that you are not overdoing it. Make sure that you let your baby crawl, scoot, pivot and spend sufficient time on his/her belly. That way, your baby can develop a good muscle strength and postural control. If you just follow this simple suggestion, activity centers can be a lot of fun for the baby and you as well! How to pick the best baby activity center? As I already mentioned, activity centers can be a pain in the neck to pick. There are so many options that after looking at some, they all kind of blend and you can't differentiate the good ones from the not so good ones. That said, if you know what exactly to look for, it soon will become apparent that some activity centers are worth it and some others are just not! So, to help you decide, here is a comprehensive list of all the things that you need to look for while purchasing an activity center. It does not matter what any of the other features are if an activity center is not stable and safe for your baby. As we saw above, the activity centers are not mobile. As a result, they need to maintain a baby in an upright position but still be very stable and secure. Make sure that the activity center that you are picking is as stable as it can get. Even if your baby is bouncing away in the center, it should not move around. Also, pay close attention to the material used in the construction. You want materials that are not flimsy and weak. Children can get bored easily. If you are investing in an activity center, you are better off selecting one that offers a lot of options for your baby to be entertained. Some of the most common toys that can be seen in an activity center include some noise and light making toys. Some of these toys may even require batteries as well. It is also important to make sure that these toys are spread out and easily reachable by the baby. On the flip side, if some toys are just out of reach, the baby may get motivated to reach for them and get some good stretching exercises in the meantime! Another important thing to note is the adjustability of the activity centers. Although some of the centers on the market will allow you to adjust the seat, some others won't. As your baby grows in height, you will need to make an adjustment to the seat so that the baby is safe and secure. The seat needs to be adjusted so that the baby's toes just about touch the ground. So, if the center is not adjustable, your baby will soon outgrow it, and it will be of no use. It goes without saying that if the activity center is not very easy to set up and use, you won't be taking it out as often as you need it. Make sure that you get the one that is easy to use as well. You don't need an activity center that has you working on it for 20 minutes just to set it up, do you? Another important thing to remember is that activity centers are going to get dirty! It is important to pay special attention to how easy it is to clean the one that you choose. If it has many parts that are difficult to clean, the activity center can quickly become a breeding ground for germs. You don't want that to happen. So, pick one that is easy to set up, easy to use and easy to clean! Longevity is another important factor to consider when you settle on an activity center. Your baby is going to use the activity center for 6-7 months, tops. Once he/she starts walking, these activity centers will be of little to no use. That said, some of the best activity centers can quickly transform from an activity center to a playing mat or a play table in no time. Once your baby does not need the activity center, just convert it into a play table in 5 minutes! It is that easy. Evenflo is amongst the most popular brands in the activity center market. They are known for their great design, durability and quality build. The bounce and learn has almost everything that an activity center should have. One of the unique things about this activity center is that it has a solid base for the baby to jump. It is one of the very few activity centers have such a support system. The system is supposed to help the babies strengthen their legs. As far as the toys go, the center has several. Most of those toys are removable, and you can detach them for you baby to play with even in their crib. Some of the best toys include cars, strollers, and stuffed animals. The activity center also has many electronic interactive panels as well. However, if you want to operate all of them, you will need 12 AAA batteries! The seat in the activity center does not restrict the movement of your baby. As a result, all the activities and toys are accessible. As a bonus, the ExerSaucer is very easy to clean as well. The seat cover fabric is machine washable. All the toys can be wiped clean with disinfectant wipes as they are compatible with alcohol containing wipes. The activity center has three adjustable height arrangements as well. The biggest problem is that it needs 12 AAA batteries in all which are a LOT! Baby Einstein is also a very well-known brand for toys and activity centers. They are best known for this sea-themed activity center. The activity center has as many as 12 activities that are sure to keep your little one occupied for quite some time. As the activities and interactive, your baby won't get bored either. The best part of the Baby Einstein Rhythm is the ability to add additional toys as the activity center has link hoops for extra toys. The seat of the Rhythm rotates a full 360 degrees allowing the baby to have access to all toys. There are three height adjustments as well. The seat pad is very comfortable and quite easy to clean as well. The best part of the Reef Activity Saucer, though, is that it is multilingual! You can operate the activity center whether in Spanish, English or even in French. Overall, it is a great activity center for bilingual households that want both English and Spanish languages. A second Evenflo entry on this list, the Triple Fun Activity Center is perfect if you plan to travel. As the name suggests, the theme of the activity center is the Amazon forest and the animals and plants that live there. Many activities are designed to develop some skillset in your child's development. For instance, the toys can help the child to develop fine motor skills, object manipulation as well as provide excellent tactile feedback. The best part of this center is that it can transform from a traditional activity center to a great play table. Once your child outgrows the need for an activity center, the center can be easily converted into a table with no need for any tools. However, the center can be a tad complicated to assemble in the first place. However, the instructions are clear, and if you spend some time, you can get it done in less than 30 minutes. Once it is assembled, you can fold it neatly for easy storage. It is light and can be carried with you almost wherever you go. We have no problems in recommending this activity center. They are one of the best baby products manufacturers in the world. So, I had particularly high hopes from their activity center, and you know what? It did not disappoint me whatsoever! The activity center has plenty of toys that will keep your little cherub busy and entertained. It is designed to be the next generation of the classic doorway jumper. The frame of the activity center is very portable, and the seat is detachable. 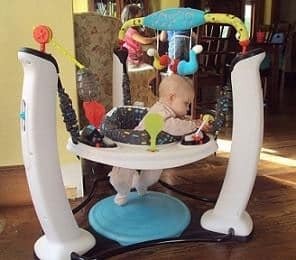 You can also adjust the height of the Jumperoo so that your baby is comfortable jumping around without the risk of falling out. 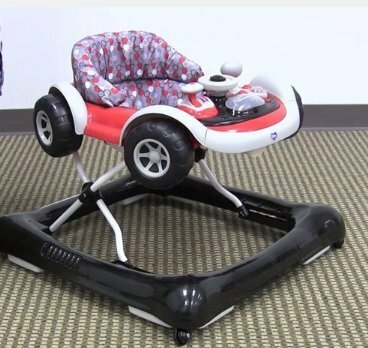 The seat also allows the baby to turn a full 360 degrees for greater flexibility. The center dismantles into smaller bits for easy storage. It is quite easy to clean as well. You can wipe-clean most parts of the Jumperoo with disinfectant wipes as well. The best part of this cleverly designed activity center is that it is available in many themes and color combinations. The lights and music system required three AAA size batteries. Overall, it is an excellent activity center, especially if your priority is an activity center that is quite portable. The Bright Starts Zippity Zoo is one of the unique activity centers on the market. 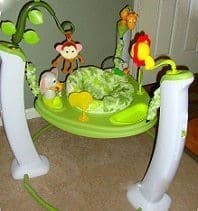 It comes with as many as 15 toys, sounds, and other interactive activities to keep the baby entertained and busy. One of the most distinctive features of this center is that rather than seating the baby in the center, the Zippity Zoo seats the baby on the side. 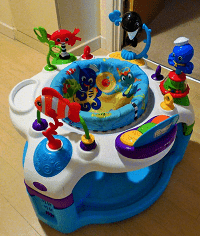 The baby seat is attached to a central toy table and can shuffle to get around all the activities. The play table has a ton of activities as well. The most fun toy is the piano that can be operated in different modes including a manual mode so that your baby can make unique sounds! The design of this activity center also allows it to be converted into a toy table or even a walker. The toys are of high quality and are easy to clean as well. Overall, it is a fantastic activity center that is worth your consideration. We have no problems recommending it whatsoever! 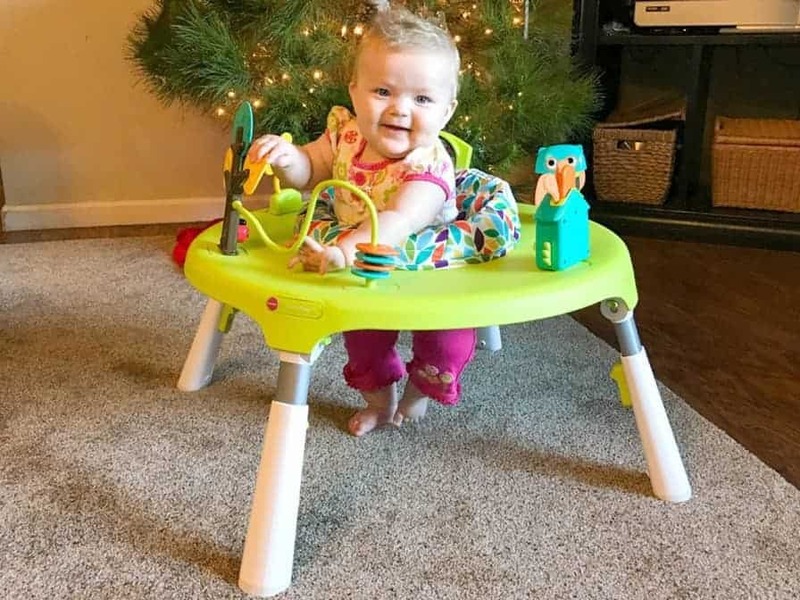 After comparing some of the best baby activity centers on the market, the Evenflo ﻿﻿ExerSaucer ﻿﻿Jump and Learn Stationary Jumper quickly easily outshines the competition. It is among the best-built activity centers with a ton of activities that keep the baby entertained. The seating system is super-comfortable and surprisingly easy to clean. The unique bouncing pad allows the baby to jump around in the activity center safely. If you are looking for a safe, well-built activity center that offers a great value, the Evenflo Jump and Learn is perfect for you! We are positive that this article will help you pick an activity center that is best for you and your precious baby. If you find this article helpful, please share it with your friends and family!